"How can I punch harder?" - this is a question I hear time and time again. 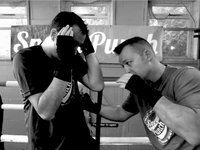 There are many things you can do - improve technique, low rep - heavy weights to build pShow More ower, speed training, but a really smart way to get the most out of your punch is to use timing and your opponents momentum. 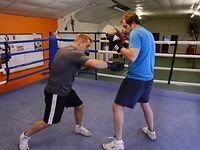 Some people are born with heavy hands and a knockout punch, some fighters can build up to this with training and maturity and some never attain it, but everyone can get a harder punch by using timing, angles and speed. A perfect example of a great boxer that did this is Naseem Hamed, his professional record has an amazing KO ratio of 36 wins and 31 by knockout. 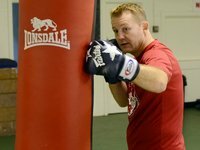 He developed his punch over the years of amateur training, improving technique, timing and his body maturing. 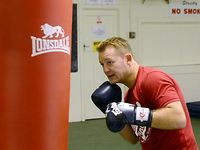 His amateur record stood at 62 wins with 18 by knockout and 14 of these KO's were in the latter part of his amateur career, this shows an immense improvement on his knockout power. 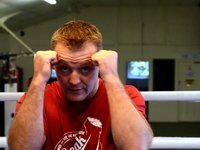 On this video I have shown just a few techniques that I used during my career to encourage my opponents to walk onto my punches. 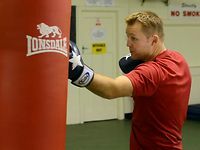 Some fighters just love to rush at you, so these ones don't need any encouragement, but the more experienced the boxer, the smarter they are, and it's these ones you need to get walking forward. Get your opponent walking towards you and throw your counter punches. 1. Start taking small steps backwards, to encourage their forward momentum. 2. 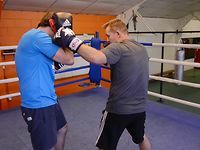 Hit their gloves or feint jabs to encourage them to punch and move forward. 3. If they start to rush forward, use angles to retreat on and fire off your counters. 4. Don't get into a rhythm when throwing counters as they become easy to block, throw them fast and strong. 5. 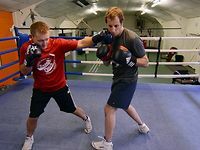 Use the stop block, use one glove to stop their jab and get your jab in first.